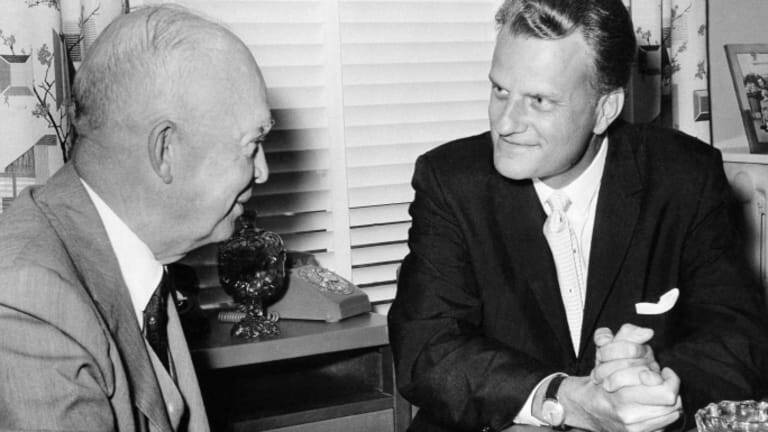 Dwight Eisenhower and Billy Graham shaped a half-century of religion in America. After his death, the Reverend Billy Graham became just the fourth private citizen in American history to lie in honor in the Capitol Rotunda, a recognition usually reserved for elected officials and military leaders. As spiritual counsel to a dozen presidents, Graham was emblematic of the mutually beneficial relationship between politicians and religious groups. The close bond between Christianity—evangelical Protestantism, in particular—and the American presidency began to form in the 1950s. That decade was a time of extraordinary religious revival: Church membership rose from 49 percent of Americans in 1940 to 69 percent in 1960. 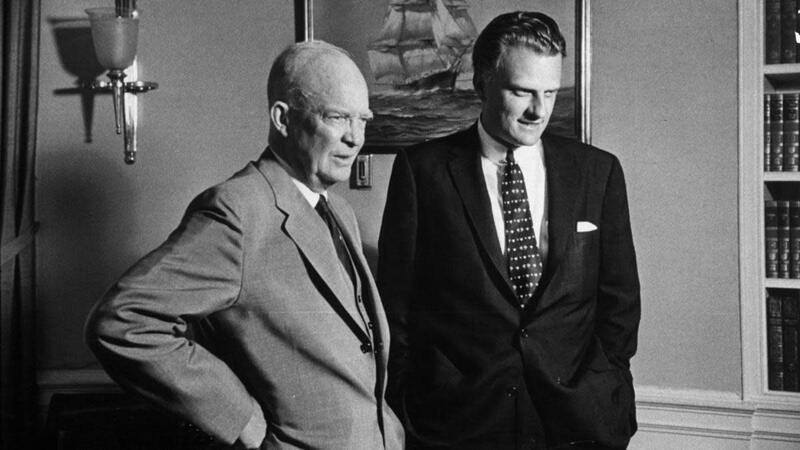 And President Dwight D. Eisenhower—along with Graham—played an important part in encouraging this spiritual devotion. In fact, Eisenhower played a very personal role in popularizing religious faith in America. On February 1, 1953, just 10 days after his inauguration, Eisenhower was baptized and welcomed into the National Presbyterian Church by the Rev. Edward Elson. 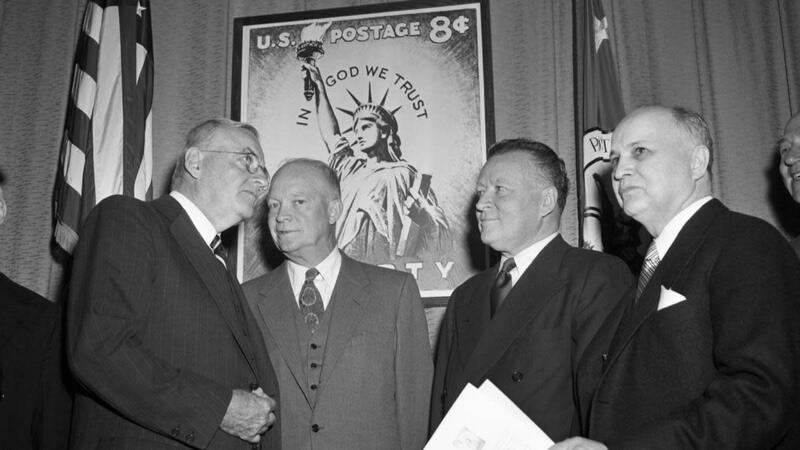 Eisenhower remains the only president ever to have been baptized while in office, and his work to link faith and American identity has influenced political debate in the country for half a century since. 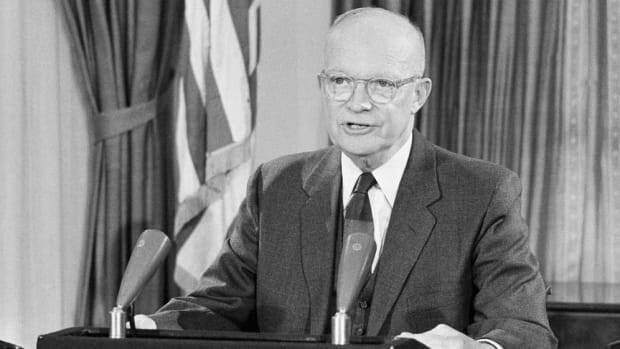 Eisenhower’s life was undeniably shaped by his religious faith. His parents, David and Ida, were members of the River Brethren church in Abilene, Kansas, an off-shoot of the Mennonite faith. Ike’s family life revolved around work and Bible study. “Everybody I knew went to church,” Eisenhower remembered in At Ease, a collection of essays about his early life. In the evenings, the family gathered in the small living room to listen as David read out loud from the family Bible. Later in life, Ida and David both became Jehovah’s Witnesses—a sect devoted to Bible study, evangelism, and pacifism. Because the Mennonites did not practice infant baptism, Eisenhower did not formally belong to any religious community. Upon taking office as the 34th president, Eisenhower felt this should change. 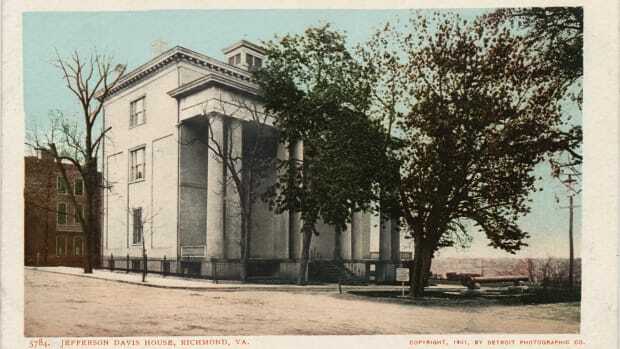 He quietly approached the National Presbyterian Church in Washington, D.C., the denomination to which his wife, Mamie, belonged, and was baptized there at the age of 62. Though the baptism ceremony itself was private, Eisenhower made every effort to place faith at the center of national life during his years in office. 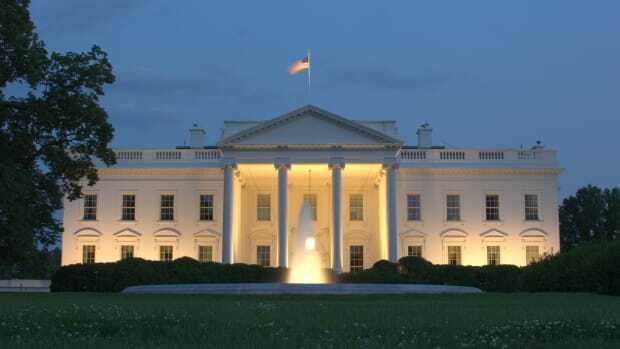 He began his inaugural address with a short prayer that he had written himself. His Cabinet meetings began with a moment of silent prayer. 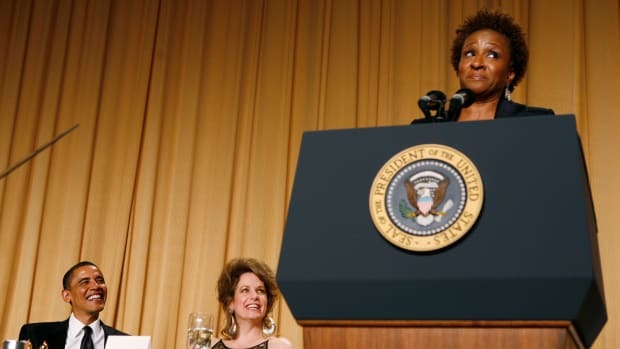 He initiated the National Prayer Breakfast, and welcomed Rev. 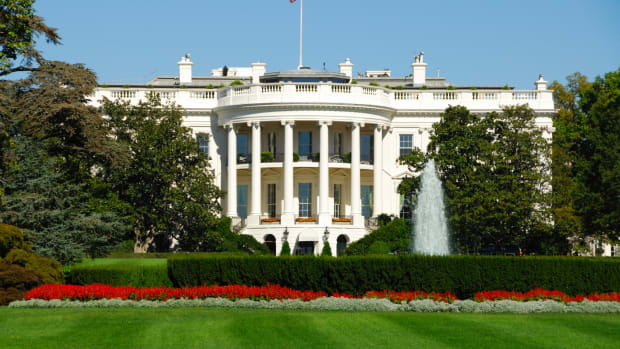 Billy Graham into the White House as a spiritual adviser. He heartily approved when, in 1954, Congress inserted “under God” into the Pledge of Allegiance and later made “In God We Trust” the official motto of the United States, even placing these words on the paper currency. Why so much religiosity? Eisenhower believed religious faith was the single most important distinction between American freedom and Communist oppression. The Soviet bloc was a tyrannical state that sneered at spirituality. Americans of the Judeo-Christian tradition, by contrast, held to the belief that every person was God’s creation. Individual human rights were therefore divine and not to be trampled underfoot by an all-powerful government. To wage and win the Cold War, Eisenhower believed, Americans must be dedicated to that principle. On Sunday, February 7, 1954, Eisenhower gave a radio address that emphasized the importance of Godliness and spirituality in American history. “Out of faith in God, and through faith in themselves as His children, our forefathers designed and built the Republic,” Eisenhower said. The president gave a brief civics lesson that recalled the struggles of the Pilgrims, the testing of George Washington at Valley Forge, and the determined battle of Abraham Lincoln to save the Union: All of these men shared a steadfast belief in God. The one unifying feature of the American experience, Eisenhower insisted, was faith—“by the millions, we speak prayers, we sing hymns, and no matter what their words may be, their spirit is the same: In God is our Trust.” At a time of surging popular piety, many Americans welcomed this kind of spiritual direction from their president. 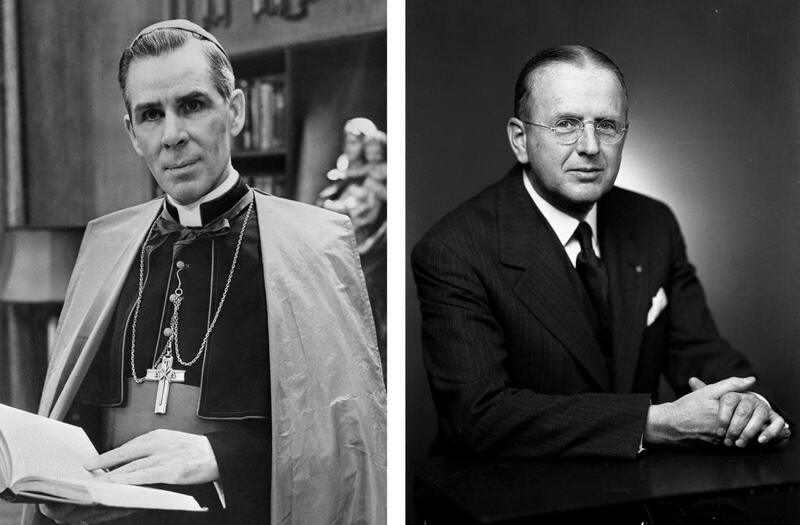 Eisenhower was not the only American making the case for religion in the public sphere. The 1950s saw the rise of popular preachers who argued that religious faith provided the solution to all manner of social and personal problems. Among Roman Catholics, the Archbishop Fulton J. Sheen of the Archdiocese of New York was a well-known figure as the longtime host of a radio show called The Catholic Hour, and, beginning in 1951, the impresario of an immensely popular weekly television program called Life is Worth Living. Dr. Norman Vincent Peale, pastor of the Marble Collegiate Church in New York City, also became an iconic figure of the Age of Eisenhower. A pudgy, bespectacled Methodist with a flair for home-spun stories, Peale published a stream of popular self-help books giving tips on finding personal success through religious devotion and scriptural study. His book The Power of Positive Thinking appeared in 1952 and stayed on the best-seller list for 186 weeks. The most significant evangelist of the postwar years, however, was Rev. Billy Graham. A tall, rangy Baptist, Graham grew up on a dairy farm near Charlotte, North Carolina, went to College in Wheaton, Illinois, and started his preaching in a Chicago-based organization called Youth for Christ during World War II. His talent, sincerity, zeal, and sheer charisma sped him on his way to stardom. In 1949, his Los Angeles revival meeting—which he called a “crusade”—attracted a third of a million worshipers and drew nationwide press coverage. Graham’s life on the national stage was just beginning. Graham first met Eisenhower in Paris, at Ike’s NATO headquarters, in March 1952. Eisenhower had not yet formally announced his candidacy for the presidency, but the general was on the cusp of jumping into politics. 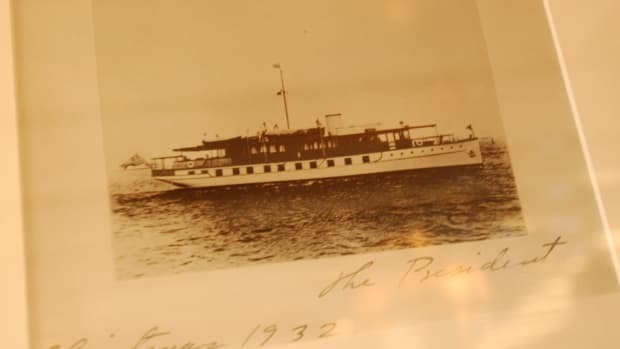 They sat together for more than two hours, as Eisenhower shared with Graham the story of his early life and his upbringing among the River Brethren in Kansas. Graham reported on the “crusade” he had recently concluded in Washington, D.C. 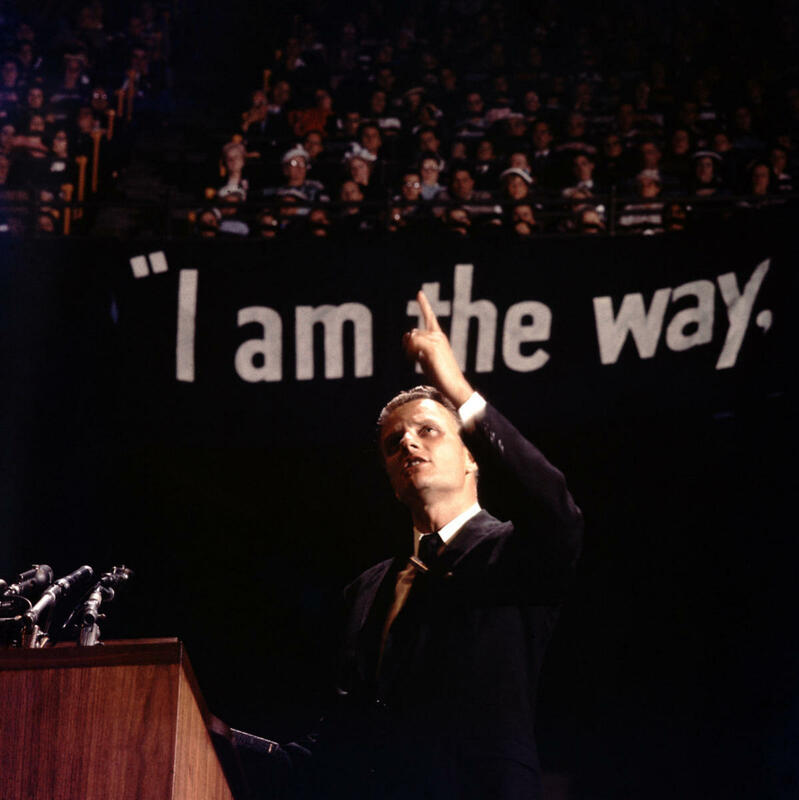 Soon after, when Eisenhower won the GOP nomination, he sought Graham’s advice for appropriate themes and scriptural passages to work into his campaign speeches. On March 6, 1955, Graham delivered a sermon directly to an American president for the first time. As the guest of Rev. Elson at the National Presbyterian Church, Graham delivered the sermon “Faith in Our Times.” Again he stressed the message that the Cold War and the H-Bomb, juvenile delinquency, racial strife, and moral weakness were all problems that sprang from a sinful human nature—all of which could be cured instantly by conversion to Christ. William I. Hitchcock is the author ofThe Age of Eisenhower: America and the World in the 1950s.